Australia can lay claim to many of the world’s greatest drives, but none more so than the Red Centre Way through the West McDonnell Ranges. 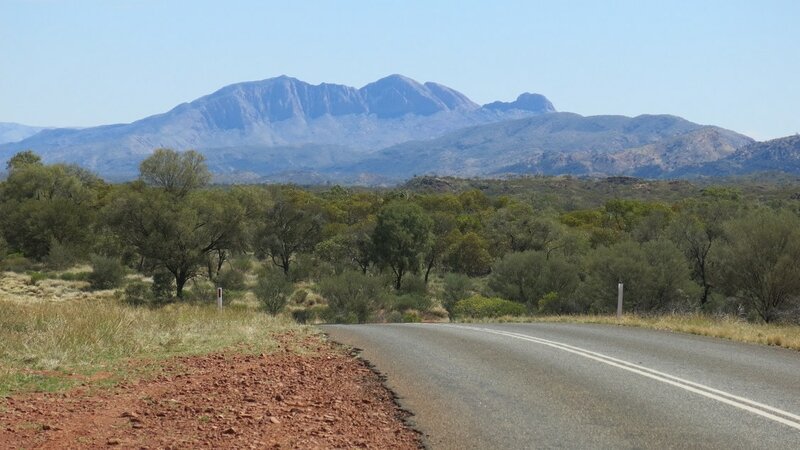 I have “done” the drive from Alice Springs to Glen Helen and places beyond along Larapinta Drive on several occasions and every time I go it throws up new wonders to behold. The journey starts on the very outskirts of the ever growing, ever expanding Alice Springs. A stone monument marks the grave of one of the nation’s most amazing men, John Flynn. He was a quiet, unassuming Presbyterian minister with a dream as big as Australia. For years he pushed the idea of a “Flying Doctor” to save injured and ill residents on the thousands of isolated properties in the Outback. Through a crude but effective pedal radio he helped develop, the people of the outback were able to radio for help and also keep in touch. Flynn pushed for the School of the Air to be established using the radio system so that outback kids could be educated. Flynn died in 1951, but his legacy lives on through the Royal Flying Doctor service and the School of the Air. So, I always stop for a while to be inspired by his story and his resting place. 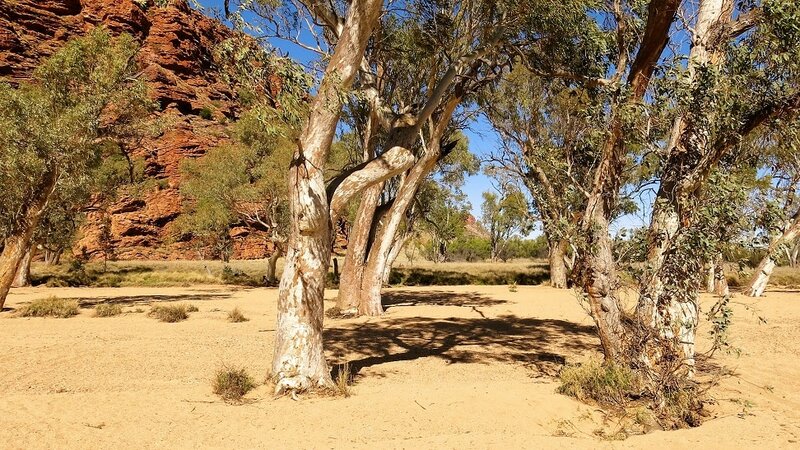 Just a couple of kilometres west on the left are the stunning white ghost gums that seem to shimmer when viewed against the red sandstone and blue sky. 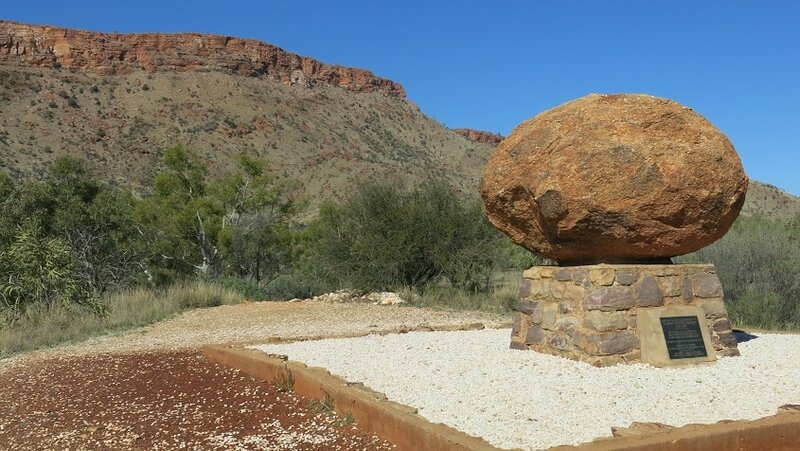 Next stop is Simpsons Gap, a canyon cut through the ranges in the shape of a massive “V”. Like most places in this region, it is now very accessible. You can do this whole trip in a 2wd vehicle. Now, I have a little tip for you. If you turn left on to Bullen Road you will find a very picturesque little known landscape with twisted uplifts of sandstone and beautiful stands of eucalypts. Further on, you will come across more stunning ghost gums and a wetland area. Standley Chasm is the next major stop and it’s rather tricky to organise. You see, you need to be there around midday to really appreciate the sun hitting the majestic narrow walls of the canyon. The further west you go, the more rugged and stunningly beautiful the landscape becomes. Mt Sondor in the distance seems to be constantly changing colour. The western gorges include several places to have a refreshing swim. 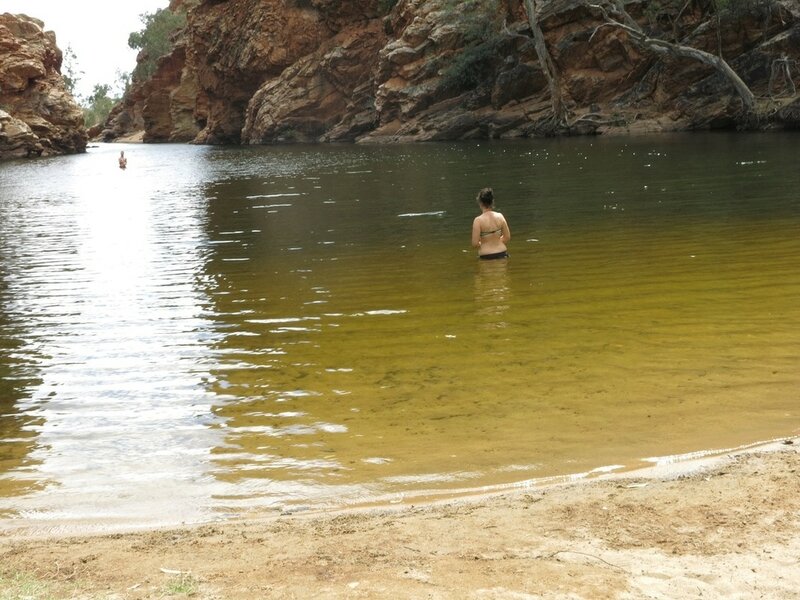 My personal favourites are Ellery Creek Big Hole and Ormiston Gorge. It can be quite chilly, but on a 40 degree day, who is complaining? It is funny who you meet swimming around in the Outback. I chatted with a honeymooning couple from Britain sitting on a sandbank and then ran into a group from China. Each one had a massive camera they were lugging Around Australia and after agreeing to take their photo by the Gorge I had to then learn how to use the complicated devices. After much arm waving, nodding and discussion in “Chinese Australia” I managed to take a few shots. Of course, they had to check the shots right away and everyone seemed to be very happy with much agreeable nodding, thumbs up and big smiles. Ah, I’d love to have two bob for every photo I have taken at the behest of strangers around the world. Then it was on to the Ochre Pits, where I once again ran into the Chinese delegation for more photos. The outstanding thing about the multilayered Ochre Pits is the fact that the pigments were traded over hundreds of kilometres for use in important ceremonial events. And so I came to final destination of my day trip west of the Alice. 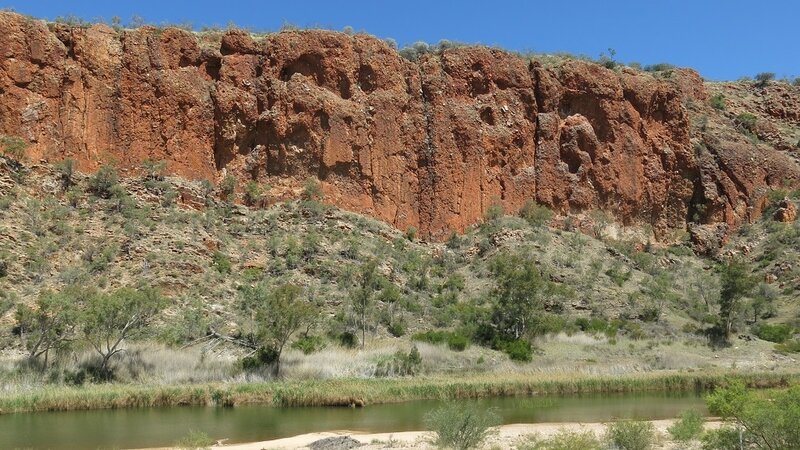 Glen Helen Gorge is the home of the world’s oldest continuous stream, the Finke River. How they work these things out, I’ll never know, but sitting on the sun drenched balcony of the homestead cafe enjoying a very nice toasted ham sandwich with a cup of fine coffee I was delighted to be in the company of such ancient places. The river flows quietly by and is quite unpretentious in comparison with its grand claims to world fame. There is a surprisingly large array of fish and other water based life living in such a dry and desolate landscape. There is also an expansive gorge that draws the mandatory groups of swimmers from around the world. Just past Glen Helen, across the river and on the right, is the Mt Sondor lookout. Go there please, because it is simply amazing. Most day trippers won’t see it in its best light, around sundown, but it is still worth taking a look and a few photos. CAPTION 3: John Flynn's grave framed by the McDonnell’s. 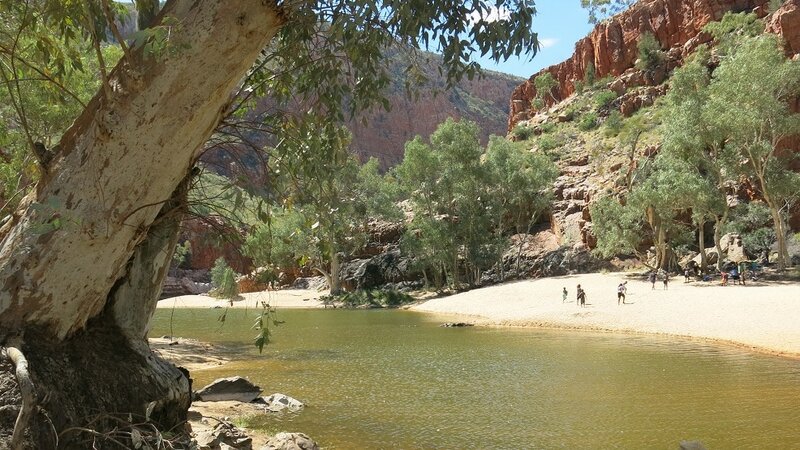 CAPTION 5: The ancient Finke River flows through Glen Helen Gorge.